Our hearts go out to all those whose businesses have been affected by the recent storms. We understand the tremendous hardship our customers and their families must be undergoing to try to get things back to some semblance of order. We want to do what we can to help you accomplish this. 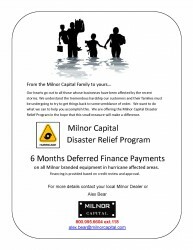 We are offering the Milnor Capital Disaster Relief Program in the hope that this small measure will make a difference. 6 Months Deferred Finance Payments on all Milnor branded equipment in hurricane affected areas. Financing is provided based on credit review and approval. For more details, contact your local Milnor Dealer or Alex Bear at 800.995.6604 x118 or alex.bear@milnorcapital.com.